Here’s a nice price on a very versatile packaged mechanical mod. 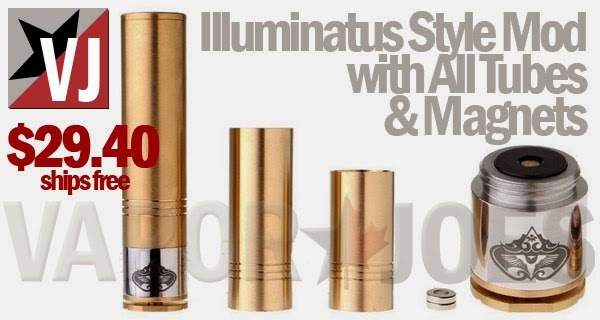 This Illuminatus styled mech includes all three tubes to allow you to use any 18- series battery, and even includes the correctly sized magnets so you can convert the switch from spring action to magnetic. It’s constructed mainly of brass, with a laser etched stainless steel switch section and copper contacts. Positive pin is adjustable. And all for under $30! 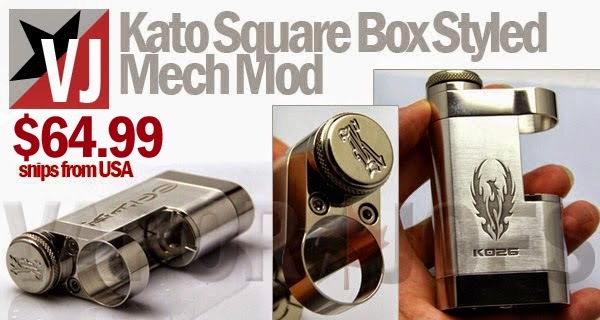 The Kato Square Box Styled 1:1 mechanical mod. It houses a single 18650 battery and the 22mm ring up top protects your atomizer. Contacts, pins and springs are copper and brass. The Kayfun style rebuildable is still very popular. One of the most annoying things about a kayfun for me was filling it. This particular design is a top filling Kayfun and has ability to rock dual coils. I love the matte stainless steel finish – it really helps the logo to pop. An epic in stock deal from the USA! The Tugboat is one of my favorite RBA’s. I have legit versions and they are FANTASTIC! Really Vaporjoe the Groove II? Yes the Groove II. Think of it in terms of the very popular MVP2. This mod goes 4 watts higher, has almost twice the internal battery size, and costs much less. 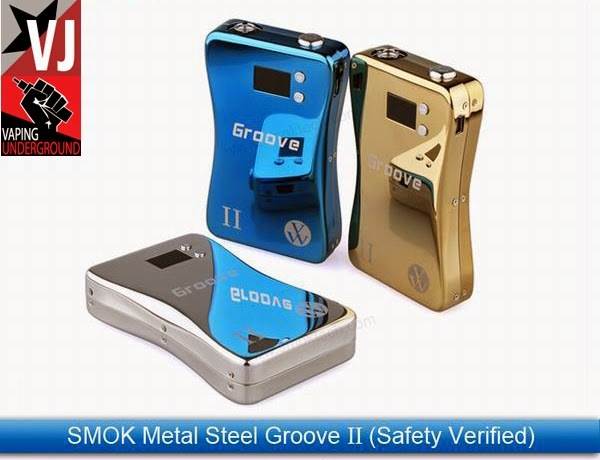 The Groove II boasts a massive 3800mAh internal battery and uses the standard 15 watt smoktech chip that comes on your Zmax. This also has a large 5 amp limit. This also comes with a 90 day warranty. You will get days out of this device before having to recharge. SmokTech re-indroduces the Groove with the Groove II. Everything you loved about the orginal Groove remains the same. All the small screws that hold the device together are now flat instead of pointed, so you no longer have to worry about the battery getting punctured if you drop it. The battery has also been reinforced, making it very difficult to ever come loose or rattle. This is a variable volt, variable watt mod. The Groove adjusts from 3.0 to 6.0 Volts in .1 volt increments or 3.0 to 15 Watts in .5 Watt increments and has a cool backlit OLED display. The Groove has a maximum output of 5 Amps. There are ample vent holes in the side of this APV for added safety. The groove has an internal 3.7V, 3800mAh Li-polymer battery that lasts far beyond most other batteries. Included with the APV are a mini USB to USB cable for charging with a computer and a USB to AC adapter for charging with a wall outlet. The button on the top of the Groove can turn the device on and off with 5 quick pushes. Read the resistance of your cartomizer or tank by holding the “+” button for 3 seconds. Easily adjust Voltage or Wattage by using the “+” or “-” button. Hold down the “+” and “-” buttons together for 3 seconds to switch between Voltage and Wattage. Output Voltage or Wattage is displayed when you press down the top button. Battery Voltage is displayed by pressing the “-” button for 3 seconds. The Groove only needs a 510 style tank, cartomizer, CE4 and some e-liquid and it is a complete ready to go unit with nothing else to buy! 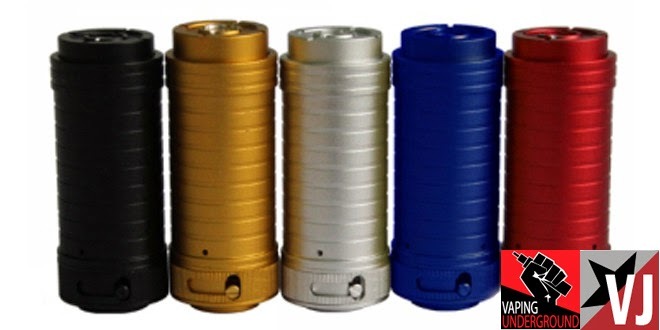 The AR style mechanical (aka The Hollow-out Mod) has gone live in some crazy new colors. It’s unique design has made it a very popular device. Now showing up in a ton of new flavors – these are bound to very very popular. This price is about $12.00 cheaper than anyone else I have seen. I posted this 5 days ago and a ton of people got in on this deal. Its STILL going strong – so I wanted to make sure everyone got in on it. Today this vendor is having a an epic sale on 100mg nic base. Dubbed the DNA30 Mini – This is a clear copy of the original Vaporshark DNA. With the exception of the two up and down buttons – its spot on. They even copied the optional belt clip screws. These come with the micro usb charger and use an internal LiPO battery – much like the original and they have an 18650 version. This is the original Vaporshark DNA20 body with a CHDNA30 board. Vaporshark has long since upgraded their design but anyone who bought the original would spot this a mile away. The next question. Will this sell? I am a HUGE fan of the legit Vaporsharks. I just bought 10 of their 18650 version for giveaways. They are one of the few legit DNA30’s that have real staying power. This all comes down to build quality and price. If we have a solid device priced under $75.00 retail? We have a winner and it will sell like crazy. If they try and make this a $100.00 item – its DOA. There is a fine line between sizzle and fizzle. $19.98 FREE SHIPPING FROM THE USA! The Lavafire Lock is an ultra lightweight mod that sports stellar good looks. This is a telescopic design and has a unique locking mechanism to prevent misfires. This is the replica of the “Titan mechanical”. The Aerotank Giant is the accumulation of all the best things from the Protank and Aero series. Like its predecessor, this clearomizer comes with food grade stainless steel, Pyrex glass, and dual coil heads. The Aerotank Giant also comes with an upgraded airflow control base to really maneuver blasts of flavor. This Aerotank Giant should be the go to for any serious vapor! Remember when these were $9-$10.00 ea? Today this USA vendor is running a great deal on a sold 18650 cell. 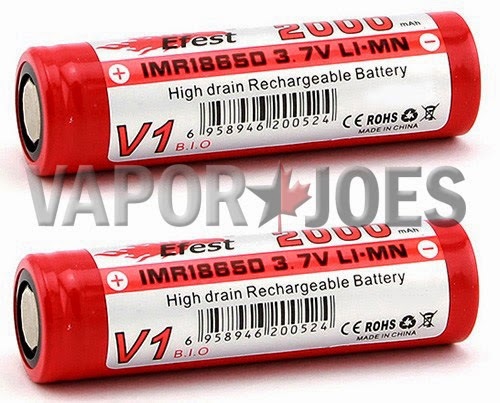 The original 14 amp Efest 18650 battery is been a tried and true battery in our community for a while. You can safely sub-ohm with these cells down to about .5 (I like to give myself some room). They also work great in all standard regulated and unregulated mods. These are rechargeable eFest brand LiMn (commonly referred to as Lithium Manganese or LiMn) batteries. They are safer chemically than Li-Ion batteries and do not need a protection circuit. These cells can handle high amperage and are safe in series or in parallel. They can be charged with any Li-Ion battery charger with an output of 4.2V. These have a flat top. They are 3.7V batteries that are rated for 2000mAh. Battery cover may vary but the batteries are always high quality and accurately rated. The changeling is a new and refreshing mod. You can change the look with different tubes and “pants”. The top cap and button mechanism remain the same in full copper for very little voltage loss. Check out the site to see the different configurations you can set up. A very very neat mod at a great price! 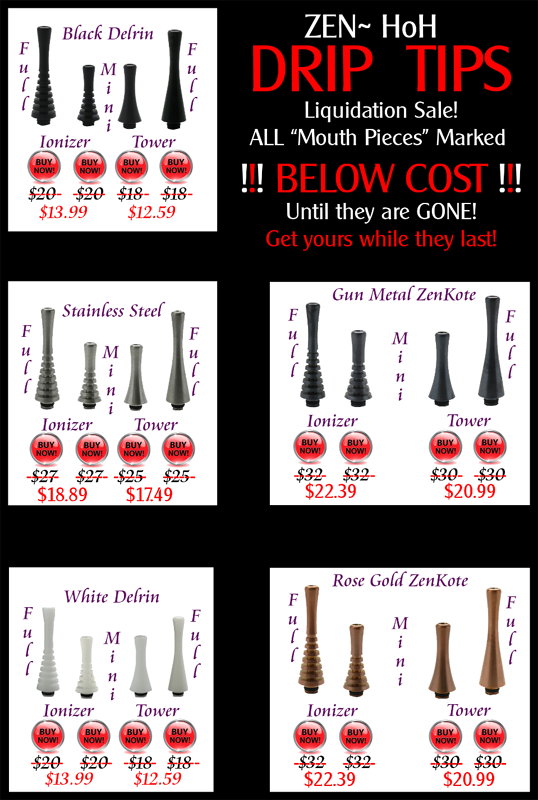 BELOW COST: HOUSE OF HYBRIDS DRIP TIPS! RBAsupplies (maker of ReadyXWick) is running a crazy sale on all their House of Hybrid drip tips. These drip tips are some of the best going. They come in all different styles, sizes, and materials. I bought one of these at VapeBash and they are a finely crafted work of art! At these prices they will not last long. Get in while you can! They are running this deal BELOW what they paid for them – so you will never see these prices again. Crazy crazy deal if you ask me! There are two pages worth of drip tips so make sure to check them all out! Be sure to check out his ReadyXWick too! 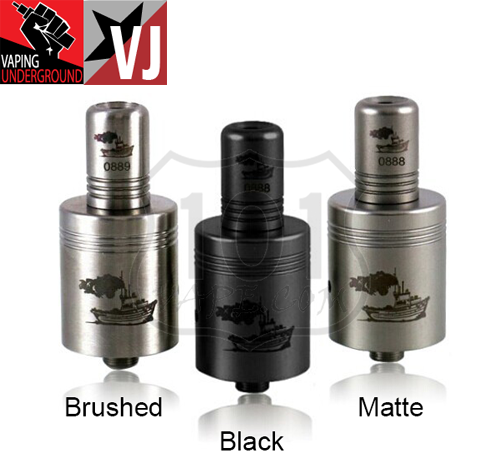 By vapor-Saturday, August 2, 2014-Uncategorized-Comments Off on BELOW COST: HOUSE OF HYBRIDS DRIP TIPS!